- Added Special XLogic to add Turbo speed boost while copying to Portable Drive. Enhance the Copy & Paste function on your Mac Now! The Turbo Copy Pro should not be missed by any Mac user, who is looking to perform quick yet clean copy and paste operations on Mac. 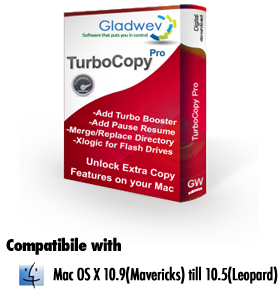 Turbo Copy Pro works as an independent application, which successfully completes the copy function on Mac, since the inbuilt Copy and Paste on Mac does not originally include all the requirements of a full and complete copy function, which the Turbo Copy Pro enables on Mac and completes the entire Copy and Paste Functions on Mac. If you expect more from the copy function from Mac, then you should definitely want to receive more, the Turbo Copy Pro is an independent application that offers you all the functions which Mac lacks, so you can get the complete package on Copy and Paste functions on your Mac! Want to know more about the professional features added to Copy and Paste function on Mac by TurboCopy Pro? or What exactly makes the Turbo Copy Pro to be much more than the average copy application? Turbo Copy Pro integrates directly in to the copy function on Mac Finder. You can directly move or paste your items that you have copied with the “Finder” with the your current selected directory, which means that you don’t need to make extra selections, as the Turbo Copy Pro integrates directly within the “Finder”. Whether you like to use the classic Mac copy option using (Command + V) key combination to initiate the paste option for your files or choose the Turbo mode enabled by Turbo Copy Pro using key short­cut: (CTRL + command + V for paste) it is your choice, the Turbo Copy Pro allows you better control on your choices, it’s easy it’s simple, it is definitely efficient! The Turbo Copy Pro allows you to Replace/Rename or Skip, since it can support transfer / Merging of various directories. It can happen that you underestimate remaining space while you copy / move the files to portable or flash drives , if that is the case, the Turbo Copy Pro will let you know and gives you the chance to clean up unwanted items. After you done with this, the Turbo Copy Pro will automatically resume the copying process without cancelling it, so you can finish what you have started in the first place and save time copying on Mac ! All in all the Turbo Copy Pro is a must have, especially if you’re looking for more advanced features for copy and paste on Mac, more than Mac has to offer at the moment. Start your copying process today and use this professional fast copying tool to get things done faster and more efficient than ever!